For several decades now, technological breakthroughs have led to changes in the way that we do just about everything. From investing to ordering food and communicating with friends, we can all think of ways that technological innovation has led to an improved process. One area where we’re seeing a large technological evolution at the moment is in the classroom. The way that we teach and learn in the classroom, conference room, and even in our bedrooms, is changing quickly. This is where Galaxy Next Generation, Inc. (OTCQB: GAXY) comes in! Education as we know it is seeing an incredible change at the moment. As a result of technological innovation and a drive to teach and learn more, better, faster… efficiently, we’re seeing a shift in classrooms and board rooms, bringing a fully collaborative interactive classroom to the table. Projectors, chalkboards, and whiteboards were the center of attention in virtually every classroom just a decade ago. Today, these seemingly archaic technologies are being traded in for up-to-date information technology that is driving a revolution in the education and learning market. At the end of the day, the classroom is changing. Today’s classrooms are picking up smart technologies that lead to an enhanced learning environment for students through the creation of a concise view of educational materials. 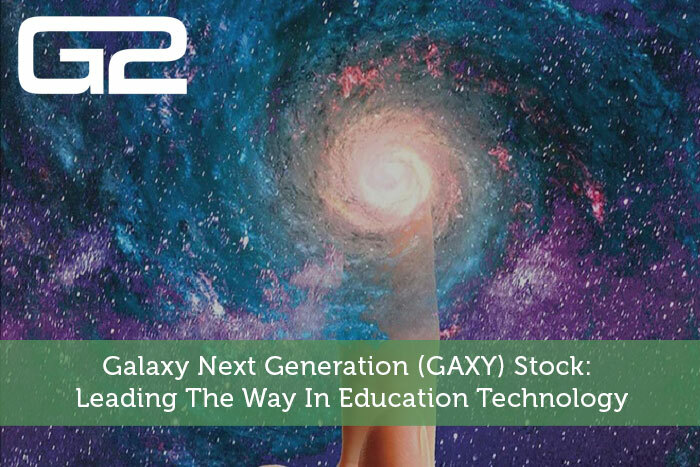 Ultimately, today’s classroom is getting smarter, and stocks like GAXY that represent the companies behind this evolution present a compelling investment opportunity. In fact, the education market is a massive and growing one. In 2017, the education & learning market was valued at about $240 billion according to Allied Market Research. By 2024, that market is expected to grow to $994 billion with a compound annual growth rate of approximately 22.7% from 2018 through 2024. Moreover, the educational content segment, a segment that you will soon find GAXY to be highly active in, accounted for the highest revenue share in the market as a whole. Key drivers of the expected market growth are interactive displays and active learning. We’re also seeing strong growth in the mobile learning space. Much of the growth in the segment is expected to come from the United States market. This is ultimately the result of strong infrastructure as well as increased adoption of innovative smart technologies designed specifically for the education and learning industry within the region. While the adoption of innovative technologies in the classroom is growing, GAXY is laying the foundation to become a cornerstone in the intuitive classroom industry, and already generating strong profits in the process. The company leverages a library of digital content and learning data with proprietary technology, creating a learning experience that is seeing a rapid increase in demand. Headquartered in the United States, the company is a distributor of interactive learning technology hardware and software. This technology ultimately allows the teacher to create a more engaging, fully collaborative instructional environment for his students. Galaxy Next Generation offers a host of products that include a private-label interactive touch screen panel used in interactive platforms that are similar to smart TV’s. The company also provides a number of national and international branded peripheral and communication devices. At the moment, the company has a core focus on the education market. However, products like those offered by GAXY are quickly picking up steam in the medical, hospitality, and tourism spaces as well. Consider the value that this type of product offers to the education industry. After all, you would likely find it easier to learn with a fully interactive interface than you would to learn out of a textbook. Moreover, the implications of this type of technology in other industries are vast. Focusing heavily on innovation and product improvement, Galaxy Next Generation has found success selling its products indirectly. In fact, the company currently has a distribution channel that features more than 20 resellers across the United States. For all of these resellers, the primary focus is the sale of the company’s product within the commercial and educational markets. Although the company has no control over where the resellers focus their efforts, it has found that about 90% of its products are being sold to the K-12 education market. Nonetheless, the company is poised to continue to grow market share in the education space while potentially earning market share in the medical and business markets. In 2017, Galaxy Next Generation made a shift from distributing products from other companies to marketing and distributing their own private label products. Itsprivate-label line is known as the SAM line. The company also entered into a partnership with a leading touch screen panel manufacturer. These moves were overwhelmingly important to the value of the company today. First and foremost, with its own line of private label products, the company has a unique product offering with improved margins over the previous business model. Moreover, through a partnership with the leading touch screen panel manufacturer, the company’s manufacturing is taken care of and it doesn’t have to worry about hiccups in growth on that side of the coin. All in all, with these two moves, the company has set the foundation for it to capture material market share across various sectors. It’s worth mentioning that the sector in which GAXY thrives is a relatively young one. In fact, there are few publicly traded competitors out there. Nonetheless, the company is no newcomer. At the moment, the company has nearly a decade and a half of experience working to fill the technological voids in the education market. Although the market is in its infancy, we are seeing a global shift to a more interactive learning environment. Around the world, several countries have taken steps to increase the adoption of smart education and learning systems, creating an insatiable thirst for innovation in a space in which GAXY is poised to become a pioneer. For example, in the United States, the government actively promotes the use of e-textbooks, graphics, and other interactive smart content for an improved learning experience. Interestingly enough, this snippet describes the impact that GAXY potentially has on this market. With a heavy focus on innovation and creating products that meet the ever-increasing demand for better ways to teach and learn, the company is positioning itself as a leader early on. At the end of the day, GAXY is presenting an investment opportunity that’s hard to ignore. First and foremost, the company is already highly profitable, with projected earnings for 2019 coming in a $0.30 per share and projections for 2020 coming in at $0.54 per share. However, aside from the profit that the company is already seeing, there’s an argument for significant growth potential here. Galaxy Next Generation is already leading the charge in the educational touch screen panel industry with its own brand of slim touch screen panels that are being sold through a network of retailers. With 90% of sales coming from the K-12 industry, the company is poised to be a prime beneficiary of the compelling expected growth in that sector. Moreover, with the company’s partnership with a leading panel manufacturer out of South Korea and a recently announced partnership in China, GAXY enjoys the competitive advantage of being able to provide better sound and touch while offering up less lag time than its competitors. These partnerships create a manufacturing flow that is second to none in the space. The company also has long-standing education contracts that provide it with material visibility and the ability to manage profitable growth. Finally, performance in the first fiscal quarter of 2019 has been impressive. While analysts expected that the company would generate half a million dollars in revenue, it showed growth of 108.1% year-over-year and actually reported revenue of $719,400, with technology sales alone accounting for more than $500,000. The strong growth seen in 2019, combined with a backlog of approximately $400,000, suggests that managements’ strong opinion that it will register material top-line growth and solid margins in Q2 are hitting the nail on the head. All in all, what we have with GAXY is a company that is quickly becoming a leader in anemerging space that has the potential to demonstrate rapid growth. Moreover, the company is already generating strong profits which are expected to grow throughout 2019 and 2020. Considering these factors, the current price of about $2.15 per share likely represents a discount to the true value of the company, offering investors a compelling potential growth opportunity! This article was originally featured on CNA Finance with all relevant disclosures.